PASCO COUNTY, Fla. - A 14-year-old Florida girl was arrested after authorities say she purposely set her home on fire while her mother and brother slept inside, reports CBS affiliate WTSP. 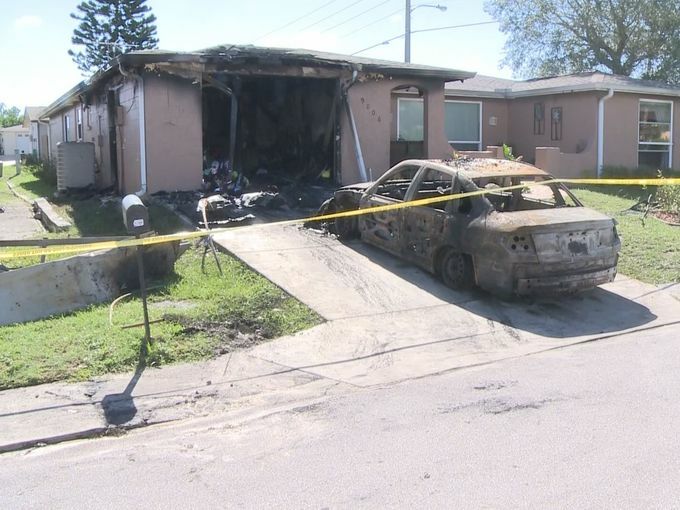 The girl's mother and her 9-year-old brother were inside the Port Richey home when it was set afire Thursday, according to the station. They heard the smoke alarm and go out in time, however, the woman's 14-year-old daughter was unaccounted for. As authorities searched for the girl, the mother reportedly began to get text messages from her saying, "Mom Im [sic] so sorry I dont [sic] know why I did it" and "Did any of u [sic] get hurt." The daughter was eventually located nearby and was taken into custody. During the investigation, the girl reportedly admitted to frequenting a website called creepypasta and another called souleater. Both of the sites feature horror stories about Slenderman - the fictional character who gained national attention earlier this year after two 12-year-old Wisconsin girls allegedly stabbed another classmate in an effort to please the character. The Florida 14-year-old accused of setting her home on fire told authorities after she was taken into custody that the horror websites made her upset about past experiences with bullying and her mother disciplining her. Authorities reportedly found a journal belonging to the teen which included several handwritten entries documenting thoughts of killing. "If this keeps up there will be no one safe in this house," one entry reportedly read. Another said: "Mom if you ever find this before it happens Im [sic] sorry..."
Authorities say the teen decided to set the home on fire, knowing her brother and mother were asleep. She allegedly took a bottle of rum and mixed it with an accelerant and used it to set the garage on fire. Investigators say they have no evidence to believe the teen set her home on fire because of violence found on websites like creepypasta and souleater, reports the station. Pasco Sheriff Chris Nocco did say, however, that while the sites may not have directly led to the fire, he wants parents to be aware of their existence and the content they contain. The State Attorneys Office has not yet decided whether the teen will be charged as a juvenile or an adult.